What is INDULGE all about? It's my little corner of this site where each month I post a collection of mostly guilt-free indulgences or treats. 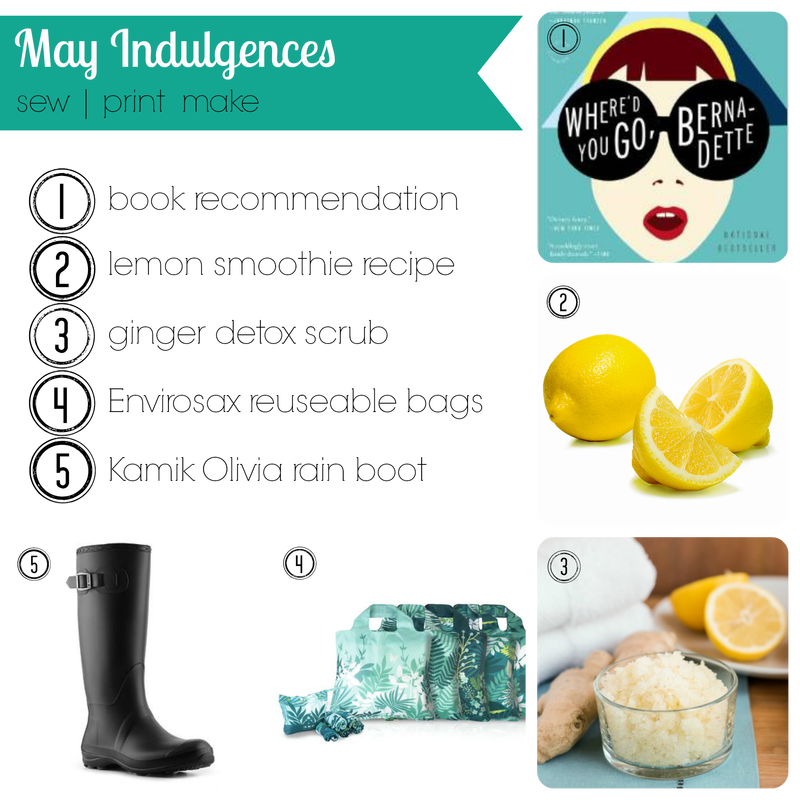 Each month there will be 5 indulgences: they will usually include a few must have products, a book recommendation, a recipe you have to try and a DIY product to make. Each month I'll create a new page of indulgences. When the month is over, I'll move the content to a sub page. Here's a sneak peek at May! ﻿Where'd You Go, Bernadette: a noveI'll admit I didn't read this - instead I listened to it via an Overdrive audio download. An old high school friend posted a recommendation for this book on Facebook and I was in need of a new read. I'm going back to him for more book recommendations! Want to read the NY Times book review? Here it is. For a refreshing and tasty smoothie to ring in spring, try this ﻿lemon lover's smoothie recipe.﻿ I recently decided to really put my Vitamix to good use (a gift from my husband last year) and I am so glad. The kids and I have been trying a different smoothie recipe daily and rating it. We use a 1-5 star scale (1 yuck, 5 awesome). This received a 4.5, highest rating yet! Pamper yourself with this easy DIY ginger detox scrub. Glass of wine, warm bath, a great read...heaven! This bags are truly superb reusable grocery bags. They are made of a lightweight but durable material, they roll up into a small size and the 5 pack comes with a handy little carrying case/pouch. These are readily available on Amazon and several other online retailers but I think the best prices can be found at Conserving Now if you hit their closeout sales and make use of their ever changing coupon codes. This Botanica 5 pack is on closeout for $29.99 plus shipping (usually about another $6)...worth every penny. Treat yourself to these and buy another set as a gift for your mom for Mother's Day (May 10th). This is a great boot! I bought these in green for my 10 year old daughter for Christmas and she is in love...and so am I. Her foot is a bit smaller than mine, though, so I can't borrow them. Every problem had a solution: I purchased a pair for myself. Black may be boring but that allows them to double for around town duty as well. I use these not only as rainy day boots but everyday gardening boots. They feel great and look pretty fashionable, too. Women's size US 9 available on Amazon for just under $36 with free shipping and returns. Many other colors and sizes to choose from. I love the navy but they are out of size 9. This is a quality boot at a great price. Disclosure note: The products listed above may contain affiliate links. If you purchase any of these items through these links, I may be paid a small commission. It's important to note that I haven't actually received any commissions yet...but there is always a first sale! I'm hoping future commissions will aide in offsetting the cost of this highly informational and not very monetized site. Thanks.